I believe that ever since the rise and growth of the Internet, times have changed so much that if you don't dominate the visual space in your battlefield with persuasive graphics -- whether you’re in the courtroom, the boardroom or the political landscape -- you will, all other things being equal, lose your battle. This was one of the themes that came up in a lunch I had with a rising political star the other day. He saw this trend clearly taking hold and rapidly advancing in his industry. I could have had the same conversation with a trial lawyer, a scientific advocate headed to a FDA hearing, or a leader of a neighborhood coalition. Persuasive graphics are coming to dominate debates. While this reality is pretty clear in courtrooms, it is only becoming obvious in political circles and everywhere else now. Recall the Obama/Romney election. The President completely dominated his challenger with persuasive graphics that got circulated by armies of followers on social media. The Romney campaign limply followed-up with weak visuals produced by amateurs. I wrote about this before election day, and I have watched the President's people just continue to get better and better at developing persuasive graphics during his presidency. I suspect the opposition continues to stumble about in the dark trying to find the right visual message. This movement is everywhere when you start looking. 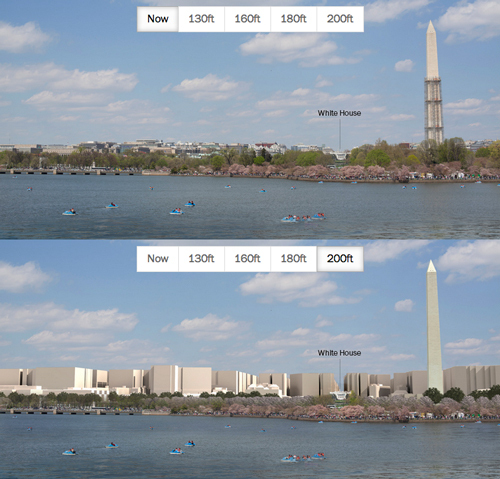 Here in my hometown of DC, there is an emerging dispute over building heights that highlights how persuasive graphics are being used for advocacy in all walks of life. Law professors have written about it. Bloggers are writing about it. Even the New York Times has written about it. As you may know, DC is architecturally unique in the United States. Here, maximum building heights are determined by a formula based on the width of the road on which a building sits. The result of these restrictions is that the tallest new buildings downtown end up being about 15 stories or so. This creates an almost anti-Manhattan landscape that is low and gives off a Parisian feel. Most DC people love this low-building feel and would not change it. However, development drives tax dollars, and the DC city council and mayor's office, both institutions not otherwise known for good taste or integrity, are advocating a major building height change. So, how are people beginning to push back? With scary visuals of course. There are pieces now in the Washington Post and The Washington City Paper that show seemingly innocuous beige buildings appearing around the city. Instead of using attractive sample buildings, they use massive beige walls. They make it look like the city and its monuments will be encircled by a massive wall of 1990's-era tower PC's. If you are looking to see this height change defeated, it's a brilliant strategy and that's how some are using these drawings. And, my bet is they'll prevail as they own the persuasive graphics landscape in this battle. Thanks to social media, mobile phones and the Internet, we can all move much more quickly now. We can get more done. We can influence more people. We can maintain relationships with more people than someone who lived just a couple of hundred years ago would meet in their entire lifetimes. This ability to move quickly is translating to efficiencies that are good for those who can keep up. Trials move more quickly. Juries demand clear information delivered efficiently. Electorates look for quick bite-sized pieces of information. We are spoiled by all this efficiency in communications. Sure, there was something romantic about a 19th century handwritten letter, but the world moves at a different pace now and using efficient communications is good business. If you are behind the curve on adopting visual and persuasive graphics in your career, now is the time. Read our blog. Subscribe to our blog. Read Professor Tufte's books. Download this e-book about litigation graphics and learn the tricks of the trade. What you have to gain is nothing less than an enhanced power to persuade.